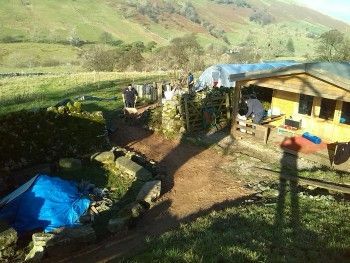 A farm in the Yorkshire dales is providing training and learning opportunities to young people who are at risk of social exclusion with support from the Cumberland Building Society Charitable Foundation. Strawberry Fields Training CIC is transforming the land at Dovengill Farm to be completely self-sufficient using permaculture techniques – a system to create permanent agriculture by relying on renewable resources and a self-containing ecosystem. The project offers specialised training, work based learning, support and volunteering opportunities to vulnerable young people and adults who are on the margins of society – those who are in addiction services, engaged with the justice systems or at risk of not engaging in education, employment or training (NEET) across Cumbria and Lancashire. The grant paid for new tools, woodwork supplies and equipment to enable students to complete their dry stone walling qualifications. It also contributed to the daily upkeep of the farm, such as gas and electricity. Kevin was referred to Strawberry Fields Training due to aggressive behaviour and anger issues. He was given a placement at Dovengill Farm, which involved assisting with the build of a new workshop and practical woodwork activities. 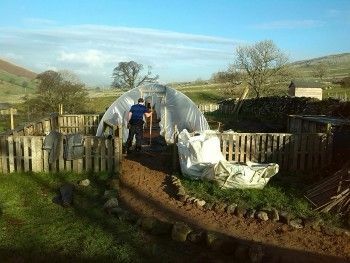 The structure of the farm has had a positive impact on Kevin; boosting his work ethic and developing social skills whilst gaining accredited qualifications.